A simple but elegant design created for a beautiful listed hotel at The Bell Inn, Horndon-on-the-Hill, Essex. The brief specified a low maintenance solution that was in keeping with the building. Standard Bay (Laurus nobilis) and Box (Buxus sempervirens 'Suffruiticosa') topiary hedging was used to create clean lines and year round interest. 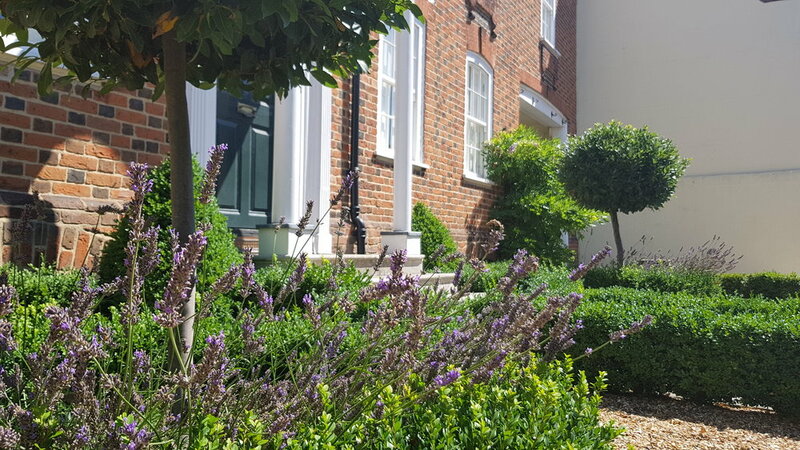 Lavendula angustifolia 'Hidcote' was added for colour and scent, providing another dimension to this pretty little front garden.